Citi analysts remain positive on the Financials sector as the improving macro environment and higher bond yields are expected to be good for earnings. A benign credit cycle, stronger capital bases and regulatory tailwinds are also likely to be supportive for the sector. The MSCI Global Financials sector has rallied 42% from mid-2016 lows. With earnings, profitability and capital returns expected to improve, Citi analysts believe that the Financials sector still can move higher and outperform the other sectors. Rising yields are expected to benefit the Financials sector: Citi's analysis highlights that in most developed markets, the Banking sector usually outperforms when 10-year government bond yields rise. Citi forecasts US 10-Year Treasuries to rise from 2.20% currently to 2.70% in mid-2018 and 2.75% at end-2018. 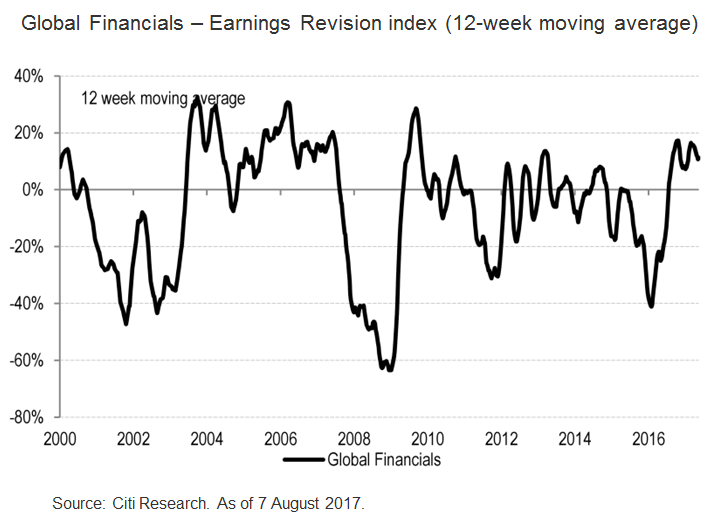 Earnings is key: Citi analysts believe that stronger earnings expectations are important in sustaining the Financial sector's outperformance. The chart shows that the Earnings Revision Index (ERI) is positive, indicating that more analysts are revising earnings up than down. Citi expects this to be the case for the rest of the year. Valuations still supportive: While valuations are no longer as cheap after the Financial sector's strong performance in the past 12 months, the sector still looks attractive compared to global equities, as represented by the MSCI World Index. Risks to Citi's view: Citi analysts believe that these include a growth slowdown, a disorderly withdrawal of central bank liquidity and a resurgence of geopolitical risk.